Your stress can feel endless… shouldn’t your hot water be too? Let Navien’s Condensing tankless water heaters take the limits off your hot water and save you money by providing an endless supply of hot water… on demand. The unit is activated the moment you open a hot water tap, supplying you with an endless stream of hot water. Traditional tank-type water heaters run out of hot water when you use large amounts of hot water from the tank. Since Navien Condensing water heaters heat the water instantly, as you call for it, there is no tank to “run out”. It also means you aren’t waisting energy maintaining the temperature in the water tank. 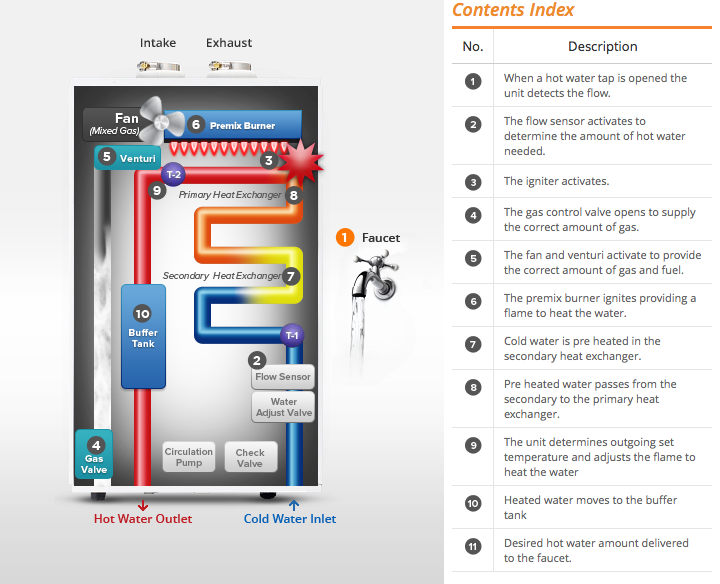 How the Navien Condensing tankless water heater works. That’s an equation you can take to the bank! Navien prides themselves on manufacturing the most cost-effective water heater available. On a personal note, company owners, Robert and Lorene Moore, installed a Navien Condensing tankless water heater in their home. Here is a comment from her. If that wasn’t enough, Navien’s state-of-the-art technology mean’s their product has a longer life span and lower operating costs than any other water heaters, which add to your savings. Navien’s space-saving wall-mount design frees up space in your home and their 15-year warranty is the best in the industry. Navien Condensing tankless water heaters are Energy Star rated, qualifying for Federal and State Tax Credits. Add it all together and the Navien Condensing tankless water heater is a great investment in comfort that will pay you back from the moment you start to use it, to your next power bill, and for many years to come. Watch a video to learn more about tankless water heaters by clicking this link. We also sell Bradford White water heaters that take advantage of draft diverter technology and are atmospherically vented. Models are available in electric, natural gas, propane and solar. With capacities ranging from 29 to 60 gallons there is the right size for any family or business. Call today and talk to our water heater specialists to find out which model will best meet your needs.